When I blogged about our trip in Oromia-Ethiopia two days ago, I had some foolish notion that I could actually write a blog post every night, but last night we were having too much fun, out on the town in Addis Ababa with colleagues and friends at a delicious Italian restaurant called Grani de Pepe, that houses the environmentally conscious Slow Food shop organized by my friend Roba Bulga. After some delicious food, delicious company, and probably too much wine, we returned to our hotel quite late. And tonight, my wife Maya will be arriving at the airport, so once again, I will be writing as fast as I possibly can, and I apologize if it is just a list of events streaming past — we’ve been so busy these past two days that “streaming past” is precisely what it felt like. So, to catch up, we continued to pursue our agenda that I laid out in the first paragraph of my last post. First, Stephen Greenwald and I visited the premier national university of Ethiopia, Addis Ababa University (AAU) where we met with the chair of the Theater Department, Dr. Aboneh, the chair of the Communications and Journalism Department, Dr. Negeri, a couple of their graduate students who work on film, and of couple of journalists who graduated from that program. 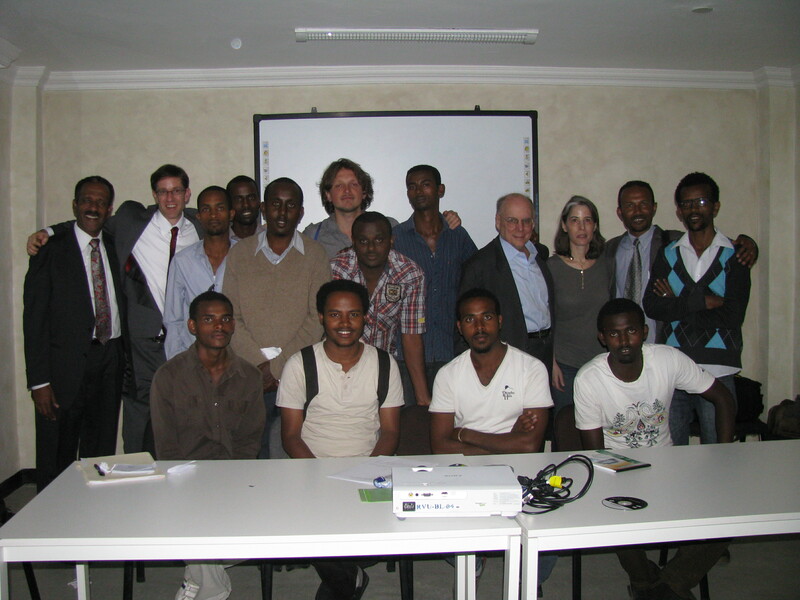 The journalists, not coincidentally, also took the transnational class on film and globalization that I taught last spring that connected a classroom of American students with a classroom of Ethiopian students. One of our topics was the discipline of film studies, which some faculty at AAU are interested in creating there. While we were having this discussion, Jennifer Dworkin was at Rift Valley University College where she held the second class for Sandscribe Communications on documentary film-making. The next big event, as I promised to talk about at the conclusion of my last post, was the grand event — a three-hour panel discussion on the production and distribution of film in Ethiopia and the possibilities for its development. The panel included Sandscribe’s founder Dhaba Wayessa who explained the reason for Sandscribe’s existence — to create a climate for young people to make creative and socially responsible films — and the point of the panel — to explore this question and get feedback from an audience that included students, professors, media professionals, businessmen, and government officials all interested in this topic. Next up was Sandscribes’ managing officer who reported on the surveys he conducted about the viewing habits of film-goers in Addis. Third was the visiting scholar Alessandro Jedlowski who gave a brief overview of his extensive research comparing different African film industries. 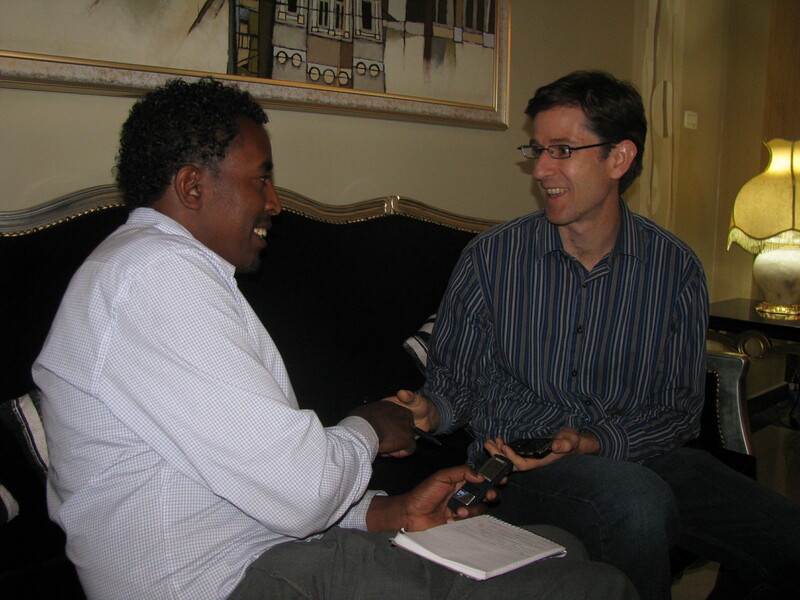 Fourth, Stephen Greenwald outlined the key ingredients of a sustainable film industry and what he had learned about Ethiopia’s strengths and weaknesses when measured against that standard. Last, I ran the discussion organized around key questions and points brought by the panelists and solicited feedback from our audience and the diverse expertise that it represented. The discussion was lively and attentive. One unexpected bonus for me at both Addis Ababa University and the Sandscribe panel at Rift Valley was the chance to meet some of the students from last spring’s class. It is also wonderful for a teacher to discover that his teaching mattered to someone, and I was overjoyed that some of them were there and could pose with us for this group photo. I was even more moved when I discovered to learn that the conversations my class had started about the globalization of the film industry were still continuing. We capped off a great day by going out to dinner as I mentioned above. Another fortunate consequence of the panel discussion is that it created enough buzz that it generated more opportunities for us. One person in the audience, Wosenyelleh Tilahun, is a businessman working for nascent production and distribution company, Sebastopol Films in Addis. Wosenyelleh had also taken my class while he was simultaneously translating another film criticism textbook from English into Amharic. This morning we visited one of the studies and theaters and discussed the business with us and the goals of his company, including the new theaters it had built. 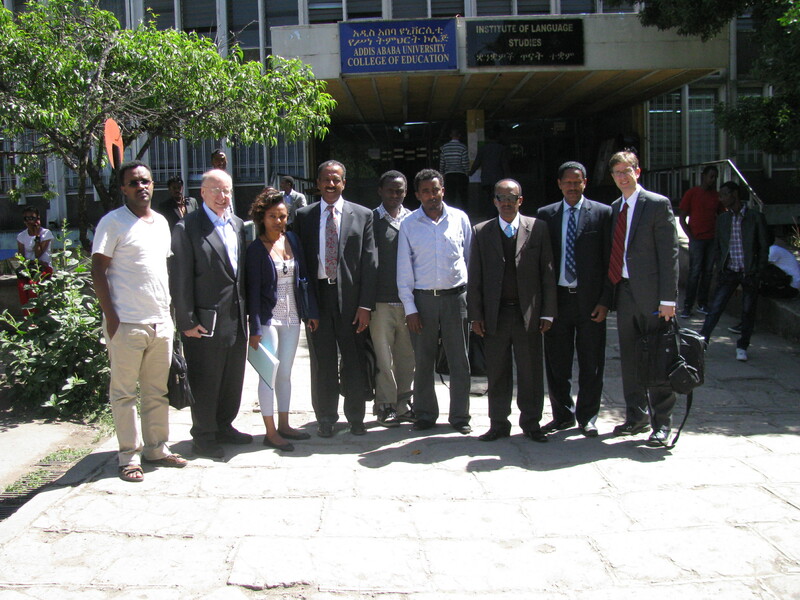 After this visit, we stopped by the Mekane Yesus Seminary, which is where Sandscribe ran its first workshops back in 2011 and 2012, to visit with its President Dr. Belay and its director of the music and media program Bereket Melese. We returned to our hotel to be interviewed by Mr. Berhanu, a journalist for the English-language newspaper The Ethiopian Herald. Meanwhile, Jennifer had gone to film interviews with three girls who are part of the REAL program to provide opportunities for disadvantaged. Next on our agenda was a conversation with Mr. Mesfin Dereje at the Oromia Radio and Television Organization Office. As many readers of this blog may already know, most of the radio and all of the television in Ethiopia is a state-run enterprise. Only recently, in 2008, has this enterprise diversified somewhat with new regional stations, such as Oromia’s, that can broadcast in the local languages. 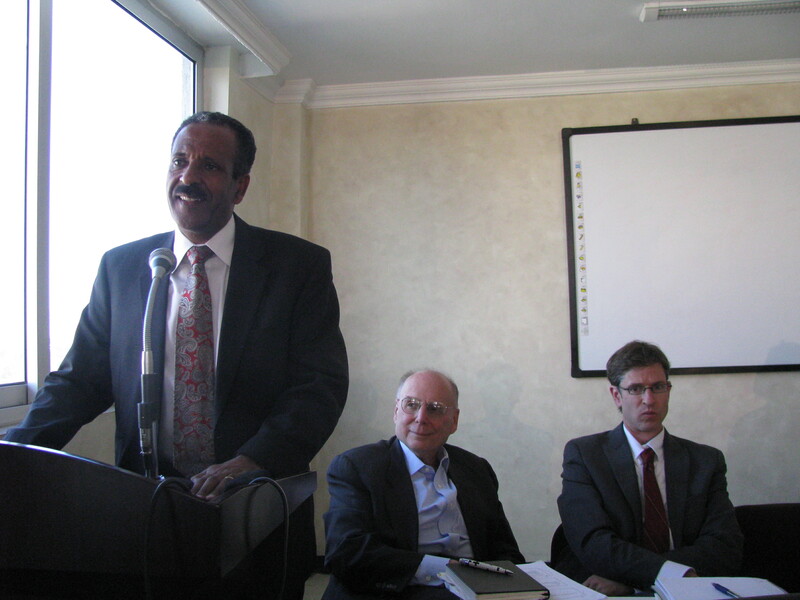 We discussed this historical change as well as the challenges of television programming in Ethiopia. We capped off the evening by going to one of the government cinemas and watching a locally produced romantic comedy about a female traffic cop who falls in love with a taxi driver. The film was actually produced by one of the graduate students whom we had met at Addis Ababa University the day before, and happily her brother met us at the door and helped us understand some of the story (since there were no subtitles.) It was a delightful movie, and what we all agreed that we most liked about it was its attention to details of the ordinary lives of working-class people. All of these events and conversations have given me a lot to think about, and I have learned a lot. I wish I could devote some time to reflecting on the events now or even just add some more hyperlinks, but it is well past midnight and instead I must go to the airport to pick up my wife. Fortunately, tomorrow has a less intense schedule.